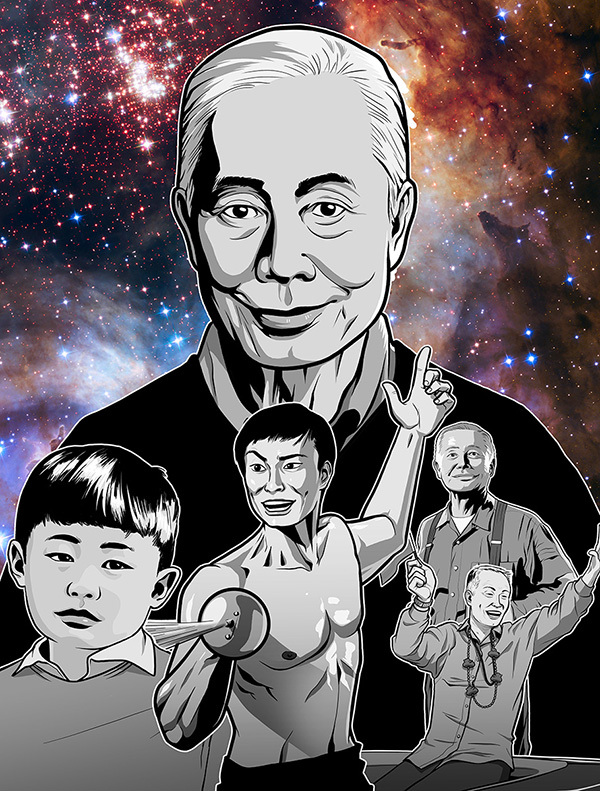 New Frontiers: The Many Worlds of George Takei explores the life and career of pioneering actor, activist, and social media icon George Takei, who currently serves on the Japanese American National Museum’s Board of Trustees. By examining Takei’s diverse experiences and achievements, this entertaining exhibition creates a portrait of a unique individual while offering an innovative means of engaging with the social history of America. Takei has been an innovator on many fronts. Through a curated selection of his artifacts, New Frontiers captures a long and colorful life while also providing a space to reflect on some of the social and political changes that rippled through America during the 20th and 21st centuries. The exhibition begins with Takei’s childhood and his incarceration, along with his family, at the Rohwer and Tule Lake concentration camps during World War II. It then moves through his career as one of the first successful Japanese American actors in Hollywood; his public service appointments, including stints on the Southern California Rapid Transit District and the Japan–United States Friendship Commission; his coming out as a gay man and his celebrated marriage to longtime partner Brad Takei (née Altman); his ongoing activism on behalf of the Japanese American and LGBTQ communities; his wild popularity as a social media figure; and much more. New Frontiers draws on the George and Brad Takei Collection, a treasure trove of personal artifacts recently donated to the Japanese American National Museum by the Takeis. The collection includes photographs, correspondence, scripts, awards, campaign materials from his 1973 Los Angeles City Council bid, and one-of-a-kind artworks made by his legions of fans. Of special note are a sculpture made from a swamp root by Takei’s father while the family was incarcerated during World War II at the Rohwer concentration camp in Arkansas; the walking stick Takei carried on his ascent of Mount Fuji in Japan; the Olympic torch he carried in the lead-up to the 1984 Summer Olympic Games in Los Angeles; and the key to the city of Roanoke, Virginia. Takei traveled to Roanoke in 2015 to meet with its mayor, David Bowers, after Bowers cited the use of Japanese American concentration camps to justify suspending the relocation of Syrian refugees to the city. 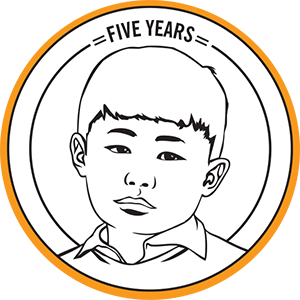 New Frontiers is curated by noted author, journalist, and cultural critic Jeff Yang. 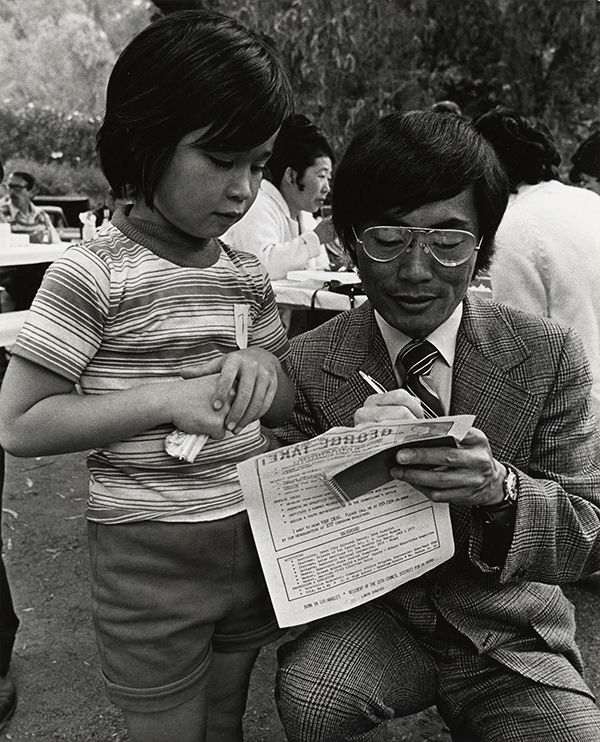 George Takei campaigning for Los Angeles City Council, 1973. George & Brad Takei Collection, Japanese American National Museum.